Thanks to record profits at Jaguar Land Rover (JLR), parent company Tata is reportedly set to double its investment in its JLR division. 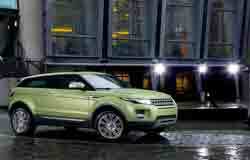 Tata has committed to doubling its annual investment in JLR, increasing it to £1.5 billion pounds. Thanks to both increasing sales in its emerging markets and increasing margins, JLR has driven growth at Tata in recent quarters, contributing to almost 95 percent of the company’s profit. JLR returned a profit margin of 20 percent through December 2011, approximately three times the profit that Tata achieved in domestic sales of Tata-branded products. Much of Tata’s revenue growth was due to strong sales of the new Range Rover Evoque, as well as increasing demand for JLR products from Chinese and Russian consumers. The company has realistic expectations of sustaining high margins, and expects to see the sales growth in the emerging markets begin to taper off. Though profits are high, Reuters reports that Tata Chief Financial Officer C.R. Ramakrishnan admitted they would be 'a challenge' to sustain. Despite initial claims that JLR production would not take place in India, Tata has moved production of Freelander 2 for the Asian market to Pune, India. Reports say the next Land Rover Defender may be built in India as well, although it isn’t clear if this production will be used for Asian market customers only. To aid with sales and profitability in China, JLR was expected to appoint a Chinese manufacturing partner and, last week, Tata confirmed that JLR had selected a joint venture partner to assemble cars in China. This move will allow it to sell its luxury cars in the emerging market at more competitive prices. Suggestions that the proposed joint venture between Chery and JLR will be based in Changshu, Jiangsu have finally gained official confirmation from regional authorities. IT has been revealed that the Chery JLR joint venture project, which is currently in the authorization phase, will be established in the Changshu Economic and Technological Development Zone, the Economic Observer News has reported. Chery and JLR have yet to officially comment on the news. Zhang Jianzhong, deputy secretary of the Changshu Economic and Technological Development Zone's Party Working Committee, confirmed the rumours, adding that 17.5 billion yuan (US$2.78b) will be invested towards the project. In addition to a new automobile production site, an engine factory will also be built in the area. The JV will reportedly work on developing new energy vehicles and own brand models. This will be Chery's second joint venture after Qoros Auto, which was established in cooperation with Quantum. Qoros also has a site in Changshu. JLR CEO Ralf Speth has told the Wall Street Journal that his company may spend up to £100 million (US$148 million) developing the Chinese plant, and said it was also considering constructing a factory in Brazil.